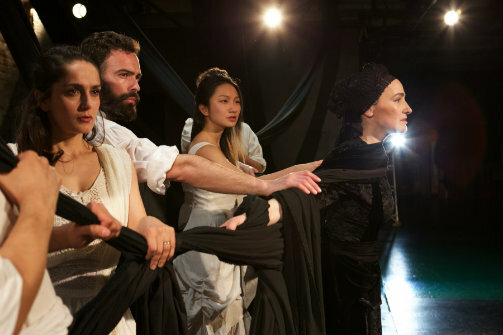 (L-R) Njomeza Ibraj Fetiu, Eshref Durmishi, Poppy Liu and Ilire Vinca Celaj in Doruntine. Photo by Alan Roche. BOTTOM LINE: Based on an Albanian legend, Doruntine is an emotionally powerful tale in a land that knows about sufferings, but also has the strength to defy death. The legend of Doruntine and Konstantin is well known in its native country of Kosovo, and versions exist as a ballad narrated in prose, and in a 1980 drama/thriller novel written by Ismail Kadare. The story is about Doruntina, the only daughter of a family of nine brothers, who wants to marry a foreigner and journey away from home to a faraway land. The entire family is opposed to the marriage, except for one brother, Konstantini. He begs his mother to give permission but she is not moved, until he offers his Besa. The Besa is an Albanian idea of a person’s most sacred oath. He promises to bring back Doruntina whenever his mother wishes him to. This theatre piece pays special attention to the two-sided emotions of the main characters, using two actors each to play Doruntina and Konstantini. Doruntina is playful and optimistic on the surface, yet hesitant and reluctant inside, performed by Poppy Liu in English and Njomeza Ibraj Fetiu in Albanian respectively. Konstantini is persuasive on the exterior, yet sorrowful with burden inside, performed by Kevin Chu in English and Eshref Durmishi in Albanian respectively. The four actors from Kosovo, speaking in Albanian, provide the mood and heighten the emotional backdrop of this faraway land likely unknown to a New York theatre audience. The mother, performed by Ilire Vinca Celaj, is memorable both in her native tongue and in English during her lonesome monologue in the graveyard. She also leads the a cappella singing of a poignant folk song. The story is told through physical movements by the ensemble of actors. There is no set, with only white and black curtains and fabrics that drape across the stage, which help dramatize this mysterious, powerful tale. There are some striking moments, such as the appearance of a nightrider on horseback at Doruntine’s house. The costumes by Anna-Alisa Belous are ivory white and simple, but with enough detail to evoke the culture of this legend. The play’s most gripping moments are the ones performed in Albanian. The actors’ deeply felt and sorrowful expressions heightened my desire to know more. The duration was a short 80 minutes; some parts could be elaborated, such as the daughter and the brother's inner world and emotional journey at the beginning. This is definitely a captivating play on a timeless, precious tale about love, loyalty and promises, and a very successful bilingual collaboration between two cross-cultural theatre companies.